Recommending a Cycling Podcast on an old favorite team. I am a big fan of The Cycling Podcast out of Britain. You might know them as The Telegraph Cycling Podcast supported by Jaguar, when during the month of July, Richard Moore, Lionel Birnie and Daniel Friebe cover the Tour de France daily from the road. Today the trio released a special hour and a half podcast episode entirely on the topic of the old USA pro team Columbia HTC-Highroad. In differing name configurations, the power-team existed from 2007 to 2011 before folding due to lack of major sponsorship. American Bob Stapleton was a man before his time. A team owner who was clearly respected in the close-knit community of cycling and yet had his issues with relationships. Whenever I spotted Bob at races, riders and staff from all teams would halt whatever it was they were doing to extend a handshake. It was moving to witness, especially after his team had folded. 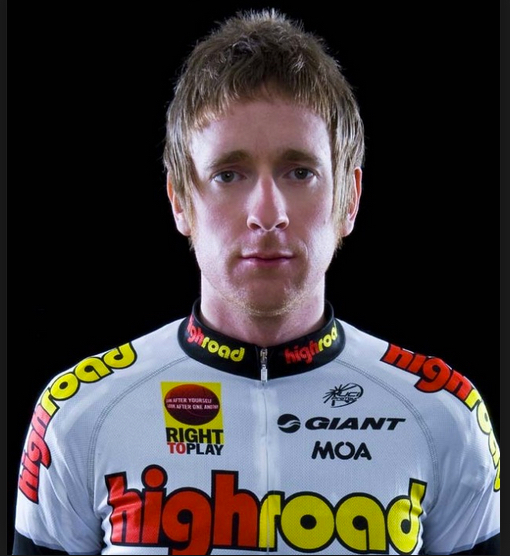 In a era when cycling was being torn apart Bob Stapleton could unite. And yet the "team of the century" - as The Cycling Podcast appointed it's title - disbanded. In 2011, I collected a collage of photographs from chasing races and cheering on my favorite team. Looking back at these old photographs and knowing now what became of the riders and staff members, I completely agree - Highroad was the team of the century. With their approach to marketing, communications, working business model, team ethos, code of conduct, team planning and scouting players, the team was an incubator for the best riders and staff in the world of cycling. Team members are now scattered throughout the peloton. Team names: Team High Road (2007), Team Columbia (2008), Team Columbia-High Road (2009), Team Columbia-HTC (2009), Team HTC-Columbia (2010), HTC-Highroad (2011). Key Riders: Mark Cavendish, Bernhard Eisel, Matthew Goss, Mark Renshaw, John Degenkolb, André Greipel, Edvald Boasson Hagen, Tony Martin, Hayden Roulston, Tejay van Garderen, George Hincapie, Peter Velits, Martin Velits, Marco Pinotti, Danny Pate, Craig Lewis, Matt Brammeier, Michael Albasini, Lars Bak, Adam Hansen, Leigh Howard, Michael Rogers, Greg Henderson, Michael Barry, Maxine Monfort, Marcus Berghardt, Thomas Löfkvist, Linus Gerdemann, Marcel Sieberg, Bert Grabsch, Kanstantsin Sivtsov, Servais Knaven, Andreas Klier, Kim Kirchen, Roger Hammond and Bradley Wiggins! Staff members now spread into the cycling community: Bob Stapleton, Allan Peiper, Rolf Aldag, Brian Holm, Valerio Piva, Jan Schaffrath, Olaf Ludwig, Walter Godefroot, Eddy Vandenhecke, Luuc Eisenga, Marco Pinotti, Servais Knaven. If you have been a fan of cycling for a decade or more, like myself, rereading these names is like realizing I was honored to watch the very best in the sport compete on one team at the dawning of a new age. Only Tom Boonen, Fabian Cancellara and Chris Froome existed for me outside this dream world. 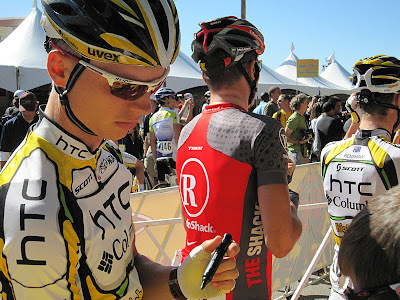 Many of the riders in the peloton have HTC-Highroad to thank for their now high salaries. Highroad was the team that inspired me to keep my attention on the sport when I was disgusted by Lance Armstrong and doping scandals. Highroad was a new kind of team. For me, this was the team bus to find at any race. Weekly you may listen to the newest edition of the standard The Cycling Podcast, but eleven times a year the trio of Richard, Lionel and Daniel dive deeper to investigate one relevant cycling topic. You will need to sign up as a Friend of the podcast to hear the special editions. I have been a friend and can attest it is absolutely worth the $14 to join (via a quick and simple secure paypal process). Cost: £10 or $14.33 (in Feb 2016), just $1.30 an episode; the best dog walking entertainment I know of! You will also want to sign up for the email news blast to know when the latest episode is available. Once you join, you have several choices on how to listen. I wait for the email announcement to arrive, click the link and eagerly listen on my iphone. Join now (link), support three investigative cycling journalists. Whatever you think you knew about the inner workings of this team, you will discover far more by listening to the podcast. My favorite quote: Ralph Aldag, "Do you remember that jersey... ah, I was crying when I first saw it." Bradley Wiggins didn't appear too thrilled with the first jersey and its cartoon style font. Remember when Neal Rogers used to report daily from the Tour de France and could never remember what stage it was or where they were? Remember when George Hincapie was the team captain teaching the young guns like Mark Cavendish? 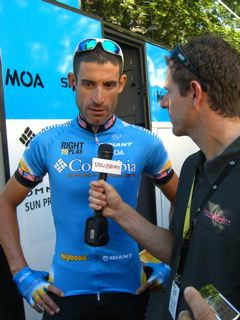 Here are George Hincapie and Neal Rogers together at the 2008 Dauphine Libere in France. 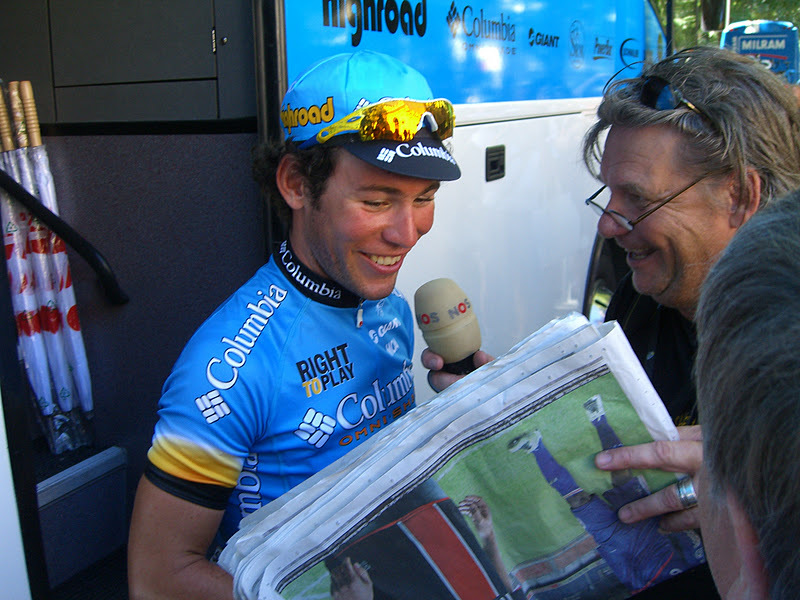 A very young Mark Cavendish in France. A very young Tony Martin. I had to check his jersey number twice, the powerful ITT whiz kid Tony Martin standing before me appeared half the size in real life. I was still so green I had to ask which Velits brother this was. Peter. 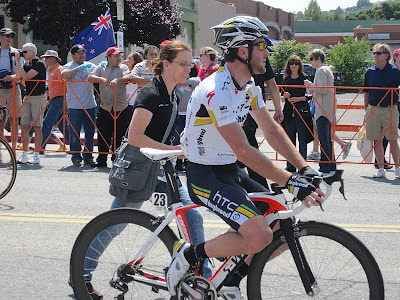 This was the moment I remember first becoming a fan of Matt Goss, when I saw what he could do in a leadout train. 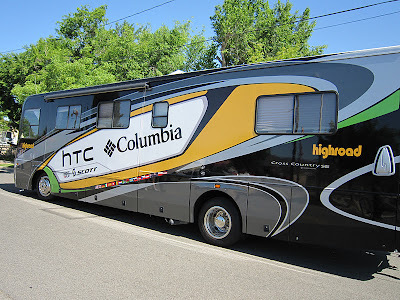 Remember the HTC Highroad leadouts? You don't see that anymore. A barefoot Bernhard Eisel relaxing in the hot California Sun. Bernie barefoot in Solvang, California pre race. 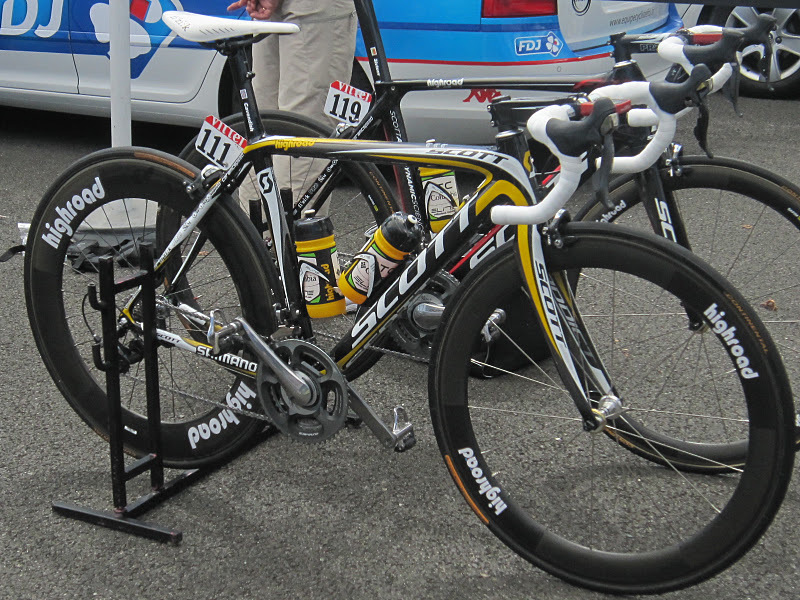 Scott bikes (I had one). Specialized bikes (I wanted one). 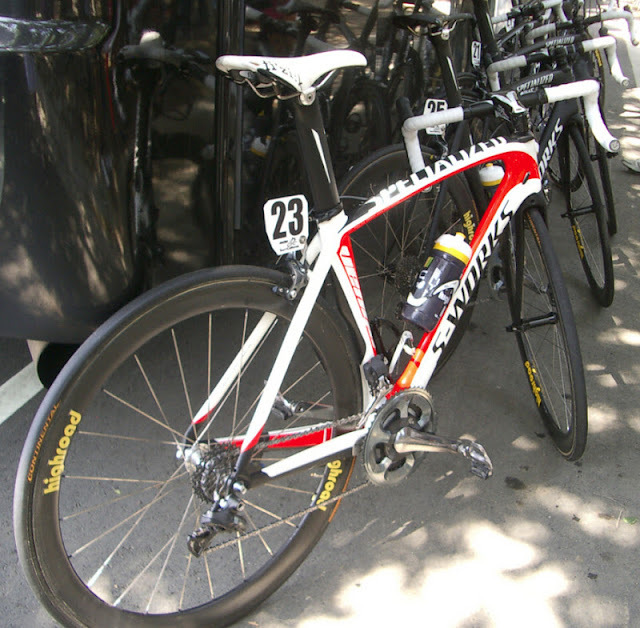 When the Venge, SL-4, and SHIV bikes became all the rage with local bike racers and cyclists. Of course I had to finish this blog post with a photo of Bernie! The worst effect when team Highroad closed is that I had to travel to Europe to see many of my favorite riders race again. In 2012 I returned to France to chase the Tour de France. Bob Stapleton is now Chairman of USA Cycling (bio). His bio states he founded High Road Sports, Inc., a sports management company that owned and operated Team HTC-Highroad, in 2005, He is a director of World Triathlon Corporation, as well as an adviser for leading private equity firms. He has an MBA from Cal Berkeley, he was born and resides in California.